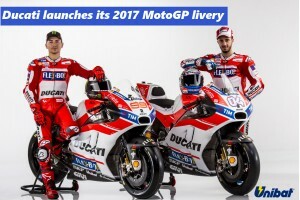 Ducati has launched the MotoGP livery Jorge Lorenzo and Andrea Dovizioso will carry in 2017. The Italian manufacturer has signed three-time MotoGP champion Lorenzo from Yamaha, in a major show of intent as it looks to win a second title and first since Casey Stoner's 2007 triumph. It ended a five-and-a-half year winless run in 2016 with Andrea Iannone's victory in the Austrian Grand Prix, before Dovizioso won the Malaysian GP at the end of the season. Ducati started testing its 2017 Desmosedici GP late last year with Michele Pirro, then gave Lorenzo and Dovizoso their first taste in the post-season Valencia running. As a result of this year's ban on winglets, Ducati is unlikely to to show a definitive version of its 2017 front fairing until closer to the season opener in Qatar in late-March. Its 2017 testing programme starts next week at Sepang with Stoner and Pirro on January 25-26, before the first of MotoGP's three pre-season tests at the Malaysian GP venue from January 30.